Already Google has got lot of services in its basket, and most of them let you create your personal profile on them like Blogger, Orkut, or Google Groups.The only problem is that you have to create separate profile for every service inspite of all of them being Google products . So for your convenience , Google is now rolling out Google Profiles. Your Google Profile will show up in all supported Google services saving a lot of energy . At this moment your Google Profile will only show the information you enter like your nickname, about field, or put a list of links. Google will not automatically populate those links by retrieving data from other Google services. In future there is a chance for that to happen . But they might keep your Gtalk and Gmail profile information private as they are considered too personal. 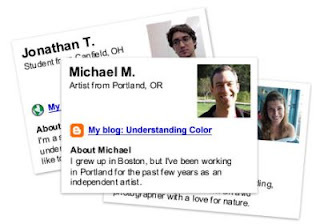 Google profile helps you in promoting your websites or links as it allows you to list the links . So How to create my Google profile Now ? If you want to make your Google Profile today, the best wasy is to go to Google Maps and click the "My Profile" button at the top of the screen. You won't find this link on most other services yet. But eventually Google plans to make your profile visible on all its services. If you use your full name as a nickname, people will also be able to discover your profile by doing a Google Search for your name.